A classically styled cruiser for the vintage-era enthusiast, Honda's Shadow Ace 1100 motorcycle is a behemoth bike for riders who know how to ride. Pairing with the right saddlebags can improve the appearance, but more importantly, help you haul your luggage from point A to point B. 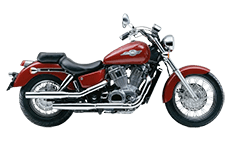 Here in our online catalog, you'll find a fine assortment of different saddlebags to fit your every need, because Viking Bags ensures that every rider is considered.